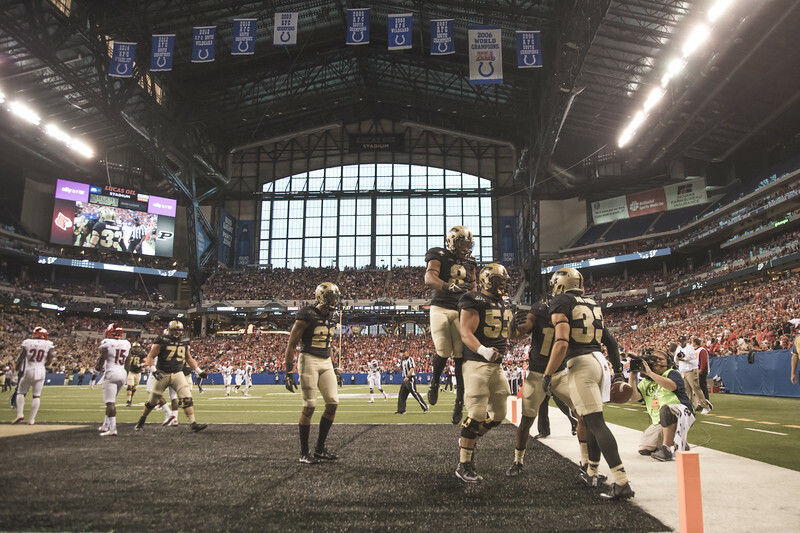 For the last five football seasons I have been able to photograph Purdue from the field at Ross-Ade Stadium. When you stop and think about it this last five years has been amazing. 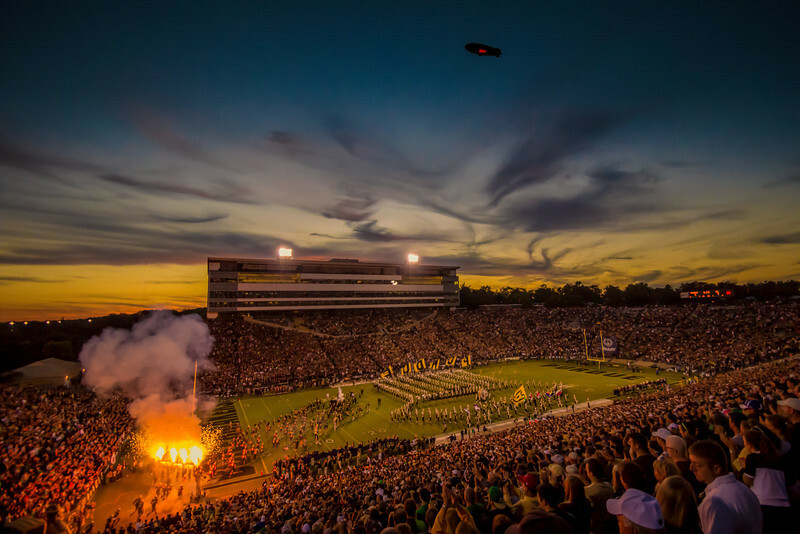 I made a photo that was very well liked, and it got me a pass to get onto the field in 2013. That was amazing to me. Over the last five seasons I have come a long way as a photographer. 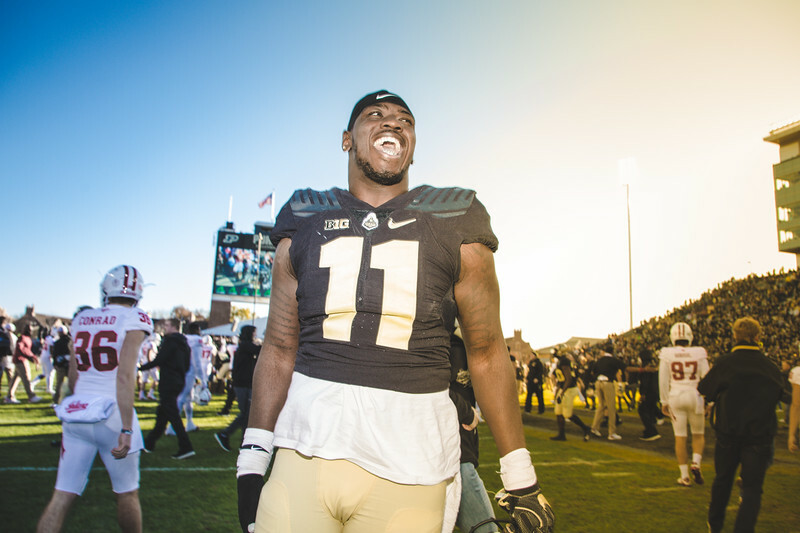 I thought that with the season opener of my sixth season on the field tonight that I would have some fun and go through some of my favorite photos from the last five years photographing Purdue football. This story really starts many years earlier. In 1995 I came down to Purdue with some friends to watch a Purdue game. Honestly I was not too excited about it. I was a huge Notre Dame fan since birth. They got me to come down to see some guy named Alstott run the football. Just like tonight the opponent was Northwestern. The Wildcats were in the midst of the dream season so that was pretty cool too. 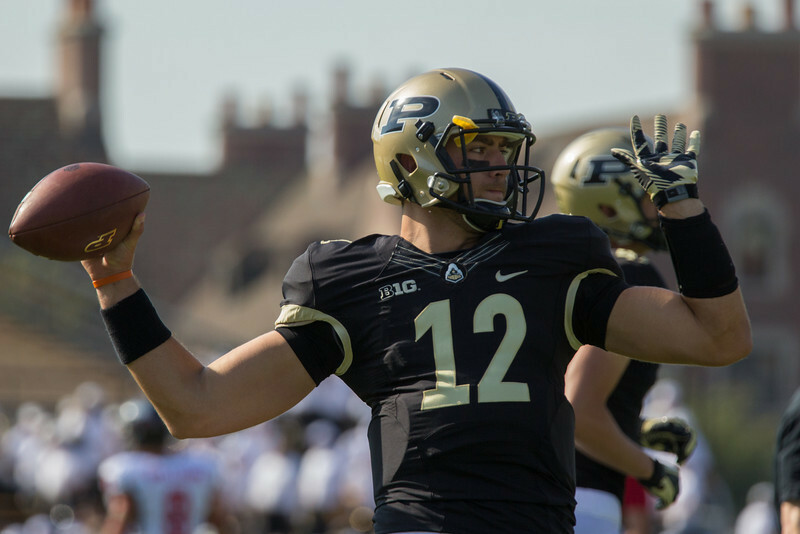 I was hooked very early on with the Purdue football program. By 1997 they had a new coach that looked way too much like my father. They also had a quarterback named Brees. Both of those men would take Purdue to heights that they had not been to in a while. 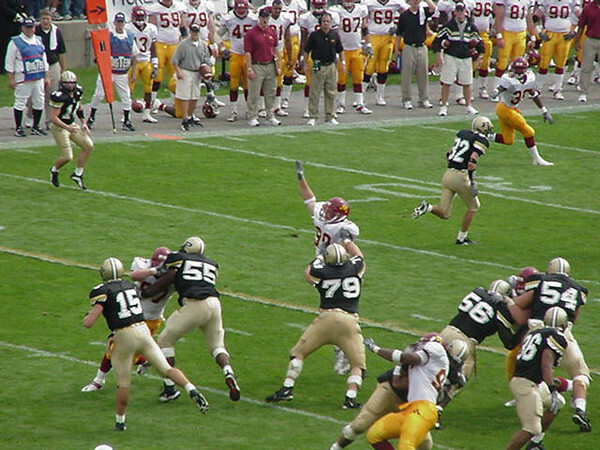 Here is a photo with my old Sony FD-88 camera of Brees throwing a pass to Vinny Sutherland. This was made in the year 2000, and that old Sony camera is the reason that I wear cargo shorts to this day. It put the photos onto a floppy disk, and at best held about 20 photos. I would have my cargo pockets filled with disks to use during a game. Blank disks in the right pocket, and full disks in the left pocket. How far have memory cards come since then? I am still stuck in the past wearing the cargo shorts though. This is the photo that started it all. I had shot the Wabash football game down in Crawfordsville earlier in the day. I was tired, but it was a huge game that I wanted to see. I was in the F lot with some family when I realized that the timing of the game could work to my advantage. I went to the ticket office and bought a $70 ticket to get into the stadium. I chose the top row of the stadium, and the girl behind the counter thought I was absolutely crazy. I picked my spot based on a hunch, and it all worked out for me somehow. This $70 gamble really paid off over the course of the last few years. I was able to do a lot of things that all came from this photo. I hated it for a while because it was all that people would talk about to me. I have come to like it now, and it holds a special place for me because of that. Now I am on the field! Standing next to people that I have long admired. My first game on the sidelines was an interesting one. I think I spent more time trying to stay out of everyone’s way instead of making pictures early on. By the end though you figure out that this field has the same dimensions as any high school field that I had ever shot at. I was that guy though on the sideline. I had my Canon 60D with my 70-200mm lens and a 1.4x extender on it. At that point I thought that I was making art. Looking back at those photos now though it looks like abstract art. As the season moved on I started to get more comfortable on the field. I met a couple of photographers that really helped guide me along early on. I made more bad pictures than good. I really knew the game, but I was not anticipating the action. Every now and then though someone dynamic like Akeem Hunt would make a run that even I couldn’t screw up. This photo was made with a 5D Mark III on a Canon 300mm f/2.8 lens. I was already feeling a little lens envy so I decided to rent some equipment. Shortly after renting the Canon 5D Mark III I had one in my possession. 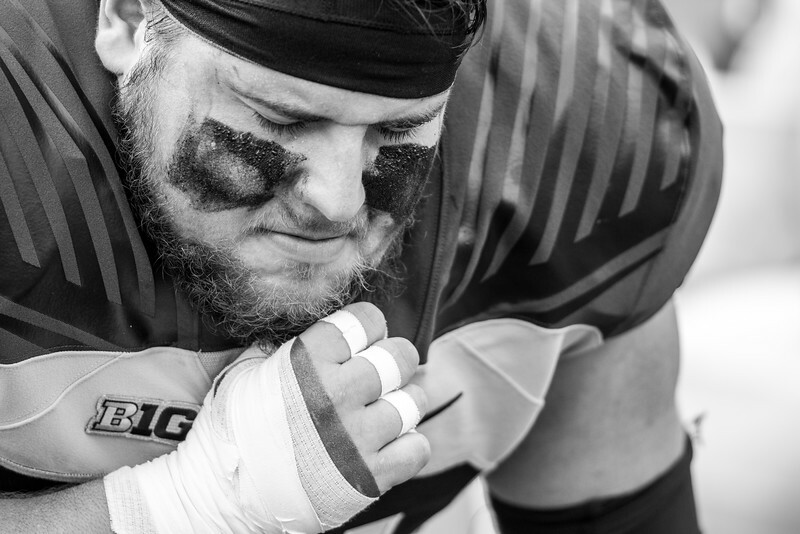 When 2014 rolled around I was ready to get back out on the field. My keeper rate went up that year. It almost had to if I am going to be honest. I bought a new Sigma 300mm lens to help me get tighter on the action. I had a Sigma 1.4x and 2x extender that got me even closer to the action, but with a huge price to pay in quality. I really thought that I was ready for the big time here. We all go through phases as a photographer. At first you realize that you don’t know anything. Quickly though you start to think that you know everything. You then come back to the fact that you still know nothing. Here I was in the phase where I thought that I knew everything. I liked my images, and looking back through the year I had some that were okay. I had a long way to go still though. When 2015 rolled around I was really starting to think of myself as a photographer. I was getting busy with actual clients paying me to make images. This was the year when things started to really turn for me. It was also the year when I fully embraced the jube. I think that at some point anyone can capture action. The fun really becomes capturing moments like the one above. The jube is where it is at. 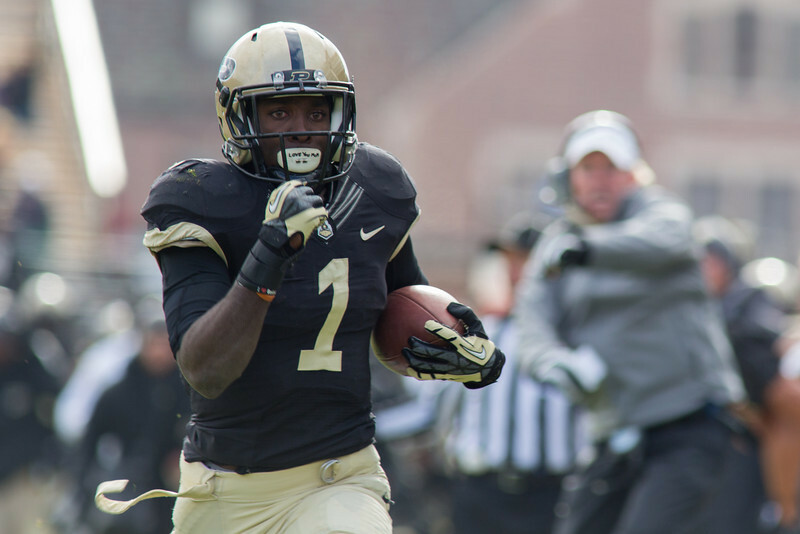 In 2016 I started to get pulled away from Purdue a bit. I was shooting more and more at other schools, and I would be gone on game days here in town. I do recall waking up in a hotel on a couple of mornings to a train horn and thinking that it was game day. Some things you just can’t take away. In 2016 I started to really start to find my way. I was not where I needed to be yet, but I could see a clear path to get there. I was so happy with many of my photos that I would put them into an Exposure page. At some point you really start to figure it out, and 2016 was that year for me. In 2017 I really started to build on what I had learned to make a complete game gallery. My schedule only allowed me to make three Purdue games though. 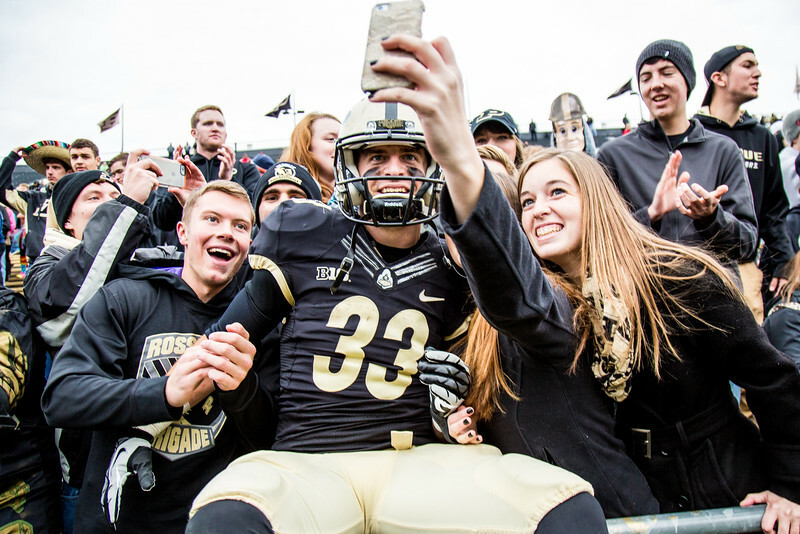 My favorite image of the year came at the first Purdue game I shot. It was the game at Lucas Oil Stadium. I love the way that this whole scene came together right in front of me. I moved to this spot right before the play, but luck really brought the play to where I was. Looking through my galleries from 2013 to 2017 is fun to do. I go from just happy to be there to being there with a purpose. Here we are now at the start of the 2018 season. To be honest when I first looked at the schedule this year I was not even going to apply for a pass. Every date but one was in conflict with something else that I could get paid for. That all changed when I came aboard the awesome team at Purdue. Before I started helping them out I talked on here about the awesome changes that were happening. To even be a very small part of that is amazing. 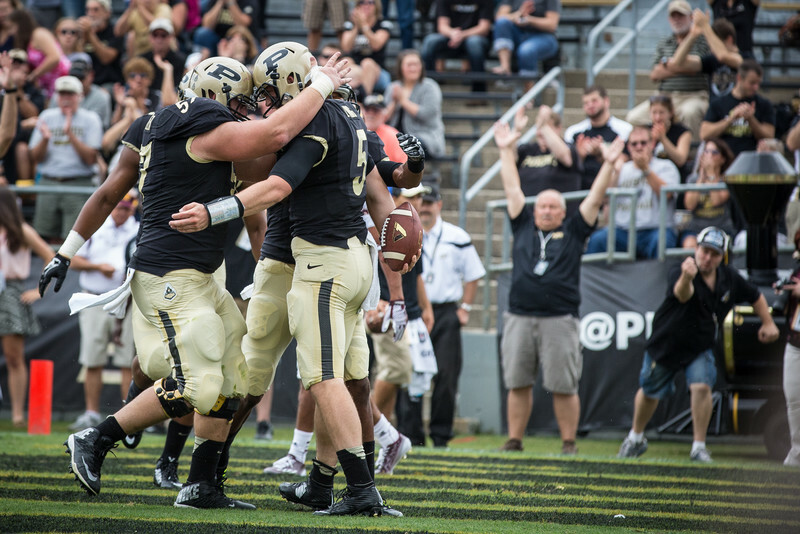 This will not be an easy year for Purdue. There is no getting around the fact that they play a tough schedule. The fun going into the season though is knowing that this coaching staff will do everything that they can to make this a season to remember. That all starts tonight with a Big Ten game under the lights to get things going. I couldn’t be more excited. Heck I am sitting here writing a post leading up to the game. It feels like everything that I have done to this point has prepared me for this moment. I can’t wait to share some photos from the game with you tomorrow.